Carpenter Ants are found throughout the U.S. and North America, including the Hawaiian Islands, The workers in this group generally are some of the largest ants you will encounter around your home. Their colonies will not approach the huge numbers of workers that the fire ants or Argentine ants do, but they make up for in size what they lack in numbers. They are not equipped with stingers, and thus cannot inflict the kind of pain a fire ant or harvester ant may, but they are capable of giving a little “nip” to your finger if they feel compelled to do so. However, biting is not the problem with them, and it is their act of digging into the wood our home is made from that causes a concern. 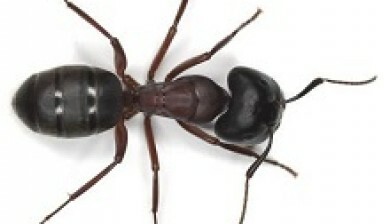 Large ants (¼ in-1 in) indigenous to many parts of the world. Can be found all year most active March thru September. Carpenter ants are aptly named. They prefer to create their colonies inside wood, and even when they nest in the soil outdoors they look for old tree root systems or buried lumber. They do not eat wood but only chew off pieces of it to expand a cavity, and then take those pieces of wood to the outside and toss them. The pieces of wood are very small, and as that pile of debris builds it looks like sawdust, and it is referred to as “Frass”. You may see this Frass on the inside of your home if these ants are working there, perhaps in the rafters above your ceiling or some other vertical pieces of wood. As they enlarge the cavities they will live in and create channels through the wood for their movement, they need to keep things clean, and periodically will chew a hole to the outside world and shove all that Frass out of the hole, from which it sifts down onto kitchen counters, window sills, or your floor. In fact, any miscellaneous junk in the colony will be ejected, and you often find other interesting things within that Frass. Carpenter ants, for the most part, are nocturnal insects and do most of their work outside their colony at night. If you need to follow the ants back to their nest in the soil you may need to spend some time with a flashlight after the sun goes down. They move along well-established trails and often choose other kinds of lines that we provide for them, such as garden hoses laying on the ground, the edges of walls or boards, and within the walls of the home along electric wires and pipes that run through the wall voids. One easy pathway for them to enter your home is the branches of trees and shrubs that touch the walls or roof outside. A major part of ant control is exclusion, and by trimming plants away from the home you can take away this access, not only for ants but for any other insects and for rodents. Most often a carpenter ant nest will begin in the soil. It is started by a solitary queen ant which has recently mated. Periodically, perhaps most often in the late spring, you will see ants with wings flying around your yard, coming to porch lights, or landing on the surface of your pool or backyard pond. These are the fertile males and females which came from a nearby colony of ants, but whose job is to mate and to initiate new colonies. The role of the male is a short and sad one, for immediately after mating with a female he will die. The female then sheds her wings, no longer needing them for any more flights in her lifetime, and she burrows into the soil or some soft wood to create a small chamber for herself and the brood to come. Starting slowly but working diligently she can build the size of her colony to as many as 10,000 worker ants in a few years, and if the colony splits and creates satellite colonies nearby the size could be 2 or 3 times that many ants, all working non-stop in the warm months to expand and find food for the colony members, all of whom are female ants. Controlling these ants can be hard work, and often must include the use of insecticides to eliminate the colonies themselves. The use of chemical tools is best left in the hands of a trained, licensed professional, however, there are many steps you can take to minimize carpenter ant activity on your property and make it as difficult as possible for them to find their way into your home. Ants belong in a healthy environment, so eradicating all ants is not the goalkeeping them out of the house is the priority. Here are some thoughts you might put to use. When removing trees also remove the roots to eliminate nest sites. Store firewood and other lumber as far away from the home as possible and elevated off the soil. Do not bring firewood into the home until immediately prior to its use. Keep wood in a dry condition, and eliminate any excessive moisture conditions indoors. The ants often are drawn to damp wood as it is easier to excavate. Repair any earth-to-wood contacts, where the wood of the structure directly contacts the soil, permitting ants to easily enter the wood. Trim all trees and shrubbery branches so that they do not touch the structure. Also trim them so they do not contact wires that run to the home, also giving the ants a pathway. 1. If wires leading to the home are serving as an ant pathway, consider coating these with a sticky substance to repel the ants, and seal any holes at the wire-to-house junction. 2. Keep garden trees and plants free of aphids and other honeydew-producing insects to minimize food opportunities for carpenter ants. 3. Pick up fallen fruits and vegetables to eliminate ant food resources Inspect the exterior of your home and use caulking or other building materials to permanently seal as many holes and gaps as possible, to minimize the opportunity for ants to enter. This commonly is around windows and door frames and beneath the siding.